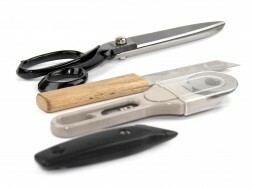 Cutting Knife (Stanley type) - die-cast metal knife with a non-retractable blade. Bades avai.. Replacement Blades for use with our Cutting Knife. .. Replacement blades for use with our hand glass wheel cutter. The blades are made fro.. The Hand Glass Wheel Cutter is a tool for cutting glassfibre mat and woven rovings. With a tungsten ..
Our Trimming Knife is a wooden handled knife with a 4" fixed blade. Ideal for trimming glass fibre m..